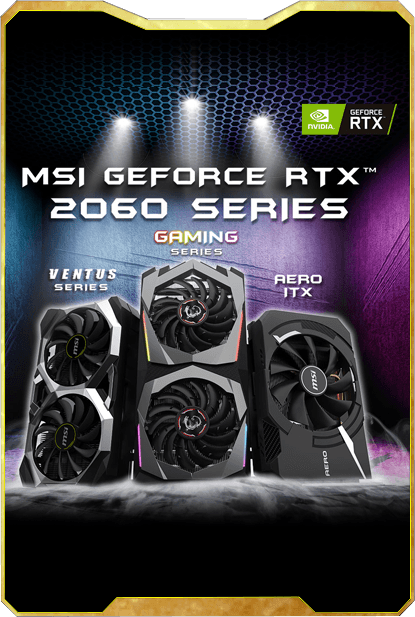 Models of MSI RTX™ 2080 Ti/2080 Series? 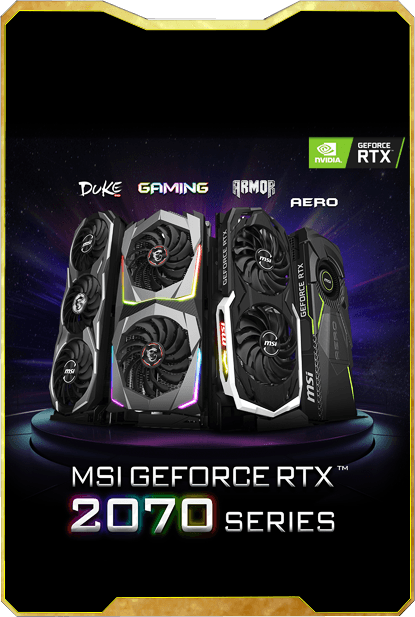 Models of MSI RTX™ 2070 Series? Shouldn’t Three Fans Spin at the Same Time? Where Did the Red Go? A Smaller Fan on TRIO? Games Support Real-Time Ray Tracing? SEA HAWK/SEA HAWK EK – Time to assemble your own liquid cooling weapon! VENTUS – If you’re looking for a dual fan on the RTX™ 2080, this minimalistic, classic, stylish industrial design graphics card will fit any case! AERO (2080 only) – Decent fan cooling system for new comers! 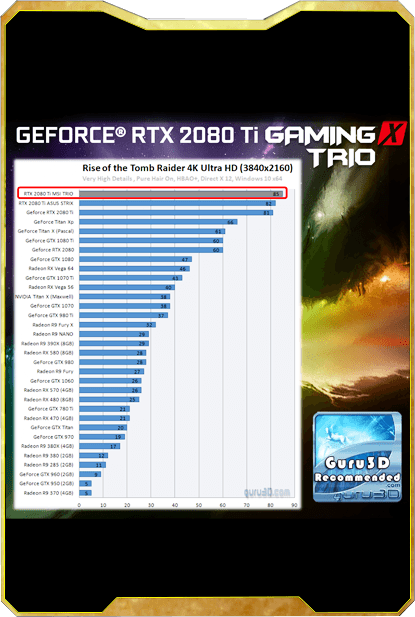 What models do MSI offer for GeForce RTX™ 2070 series? VENTUS – This minimalistic, classic & stylish industrial design graphics card will fit any case! AERO/AERO ITX – Decent fan cooling system for new comers! 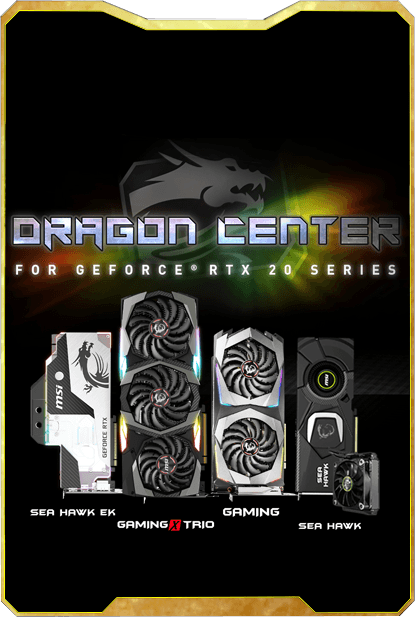 Why are MSI RTX™ 20 series graphics cards the best choice? 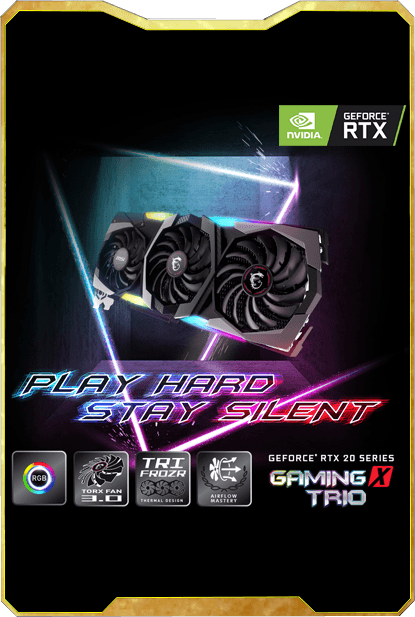 Above all of the sayings, you’ll truly experience how “Game Hard, Stay Silent” feels like and be thrilled after gaming with MSI RTX™ 20 series graphics cards. Why do some fans stop while others keep spinning on the RTX™ 2080 GAMING TRIO/DUKE? First of all: Don’t panic! Our ZERO FROZR technique used on the RTX™ 2080 GAMING TRIO/DUKE is a bit different from the RTX™ 2080 Ti. The middle and the right fan will start spinning when the temperature is 56°C or higher, while the left one starts to spin at 60°C. To make it more specific, the GPU and memory are located under the middle fan and the right-side fan (these components generate the majority of heat). This is why we trigger these fans first as they will provide the cooling where it is most needed. While the temperature is continually rising, the third fan will start spinning to provide additional cooling. We still love red. Yet this time, we invite gamers to define the color you want, using our Mystic Light Software! You are in total control of your rig now. Yet you never know when the red will return, stay tuned! I’m a huge RGB fan, which model can fulfill my RGB dreams? GAMING TRIO, GAMING, SEA HAWK EK,DUKE(2080 Ti/2080 only) and ARMOR. Customize the lighting effects with MSI Mystic Light software! Why is there a smaller fan on the GAMING TRIO? 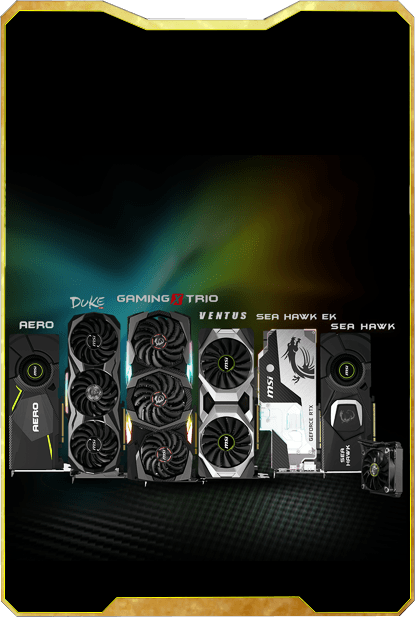 Normally, most of the triple fan graphics cards on the market feature three 9cm fans. We know gamers are expecting to have a better gaming experience when using an SLI setup. To maximize the heat dispersion on GPU and memory and to leave space for the NVLink connector, MSI applies two 10cm + one 9cm TORX 3.0 fans on GAMING TRIO. This results in a great gaming performance while still having stable cooling AND enough space for the NVLink SLI setup. Which software supports the GeForce RTX™ 20 Series graphics cards? 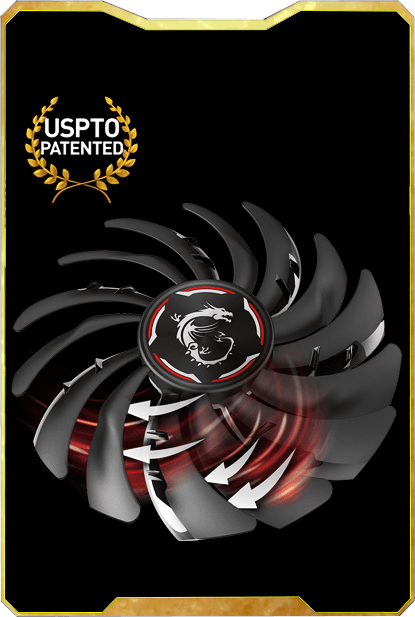 World’s most recognized and widely used graphics card overclocking utility which gives you full control over your graphics card: works with all graphics cards. Let your RTX™ 20 series graphics card get a free performance boost with Afterburner OC scanner! What games support Real-Time Ray Tracing technology? Get yourself a RTX™ 20 series graphics card and enjoy the latest ray tracing feature!